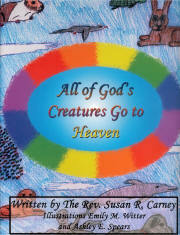 All of God's Creatures Go to Heaven is a delightfully illustrated book for children of all ages. Through the writings of Susan Carney and the illustrations of Emily Witter and Ashley Spears, we are given the assurance that all of God's created animals do go to heaven just as humans do. There are quotations from the Bible and other writers, and a copy of Rainbow Bridge, that help to give the readers the hope and assurance that All of God's Creatures Go to Heaven. It is also our hope and prayer that books like this one will help our children grow up with a love for God and the whole of His creation, so that they no longer desire to participate in the exploitation of any animals and who, as children of God, will live on forever and ever with God and all His beloved animals. We highly recommend All of God's Creatures Go to Heaven to anyone who has beloved children. The Rev. Susan R. Carney has been a Priest for over 25 years. She was ordained in the Episcopal Church December 20, 1980. She has her M.Div. from Princeton Theological Seminary, her "Anglican Studies Degree" from The General Theological Seminary, NYC; and her S.T.M. in Spirituality from Yale University Divinity School. The Rev. Susan R. Carney is also a veteran of the United States Armed Forces having served on active duty for 20 years as a Navy Chaplain. She retired two years ago from active duty with the rank of Commander to follow God's call for her to fulfill her "PETPRIEST" ministry. Some of her distinctions on active duty include First woman on active duty in any of the Armed Forces in the Episcopal Church; First woman Chaplain to deploy to war as Command Chaplain on USS Suribachi (AE-21) during Operation Desert Shield/Storm; First woman Priest to serve as a group Chaplain with the United States Marine Corps FMF; First woman Priest to serve at the United States Naval Academy; First woman Priest to serve onboard the nuclear powered Aircraft Carrier (6,000 Sailors and Marines) USS Nimitz (CVN 68) in an "around the world deployment" including five months in the Persian Gulf.